When photographer Ian Pelham Turner was chosen to shoot the first Christmas photos of a baby Prince William with Princess Diana and Prince Charles in 1982, he was given all of seven minutes to get the job done. Times have certainly changed now that Prince William is a parent himself. On Monday, William and his wife, Duchess Kate, released their first family photos showing them with Prince George, who was born on July 22. They weren’t shot by a professional photographer, but by Kate’s father, Michael Middleton. Kate, looking chic in a $72 fuschia dress by Seraphine Maternity, is pictured holding a sleeping George next to William on a sunny day earlier this month in the garden at her family’s home in Bucklebury, England. Unlike Turner, Middleton was presumably allowed to speak and interact with the royal couple and had more than a few minutes to snap the photos. The family’s pets even joined in the fun, as one shot features the Middleton’s retriever, Tilly, and the couple’s cocker spaniel, Lupo. A downside of having Prince George's grandfather take the photos instead of a professional has been some online criticism that the backlighting could use some work and the shots are out of focus. "William and Kate have always done things their way, and this informal set of royal baby photographs proves that,'' NBC News royals expert Camilla Tominey told TODAY.com. "Taken by Prince George's grandfather Michael Middleton, they project an image of a very down-to-earth couple, seemingly free from the stuffy constraints of royal protocol. This is a very modern vision of monarchy, dispensing with some of the more formal traditions of the past. Once again it shows that when it comes to how they manage their own lives, the duke and the duchess aren't willing to be dictated to — they are the ones calling the shots." The relaxed, do-it-yourself approach of the royal couple is a far contrast to the pressure-packed, formal atmosphere that Turner encountered when he was chosen to take William’s first Christmas baby shots with Diana and Charles on Dec. 23, 1982. During the shoot, a man stood with a stopwatch to ensure that Turner only took exactly seven minutes to snap the photos. An unforeseen complication had Turner sweating out the seconds as the time ticked down. Luckily, Diana turned a potential disaster into a famous photograph. It also turned out that Turner’s time wasn’t quite up after grabbing a memorable shot. 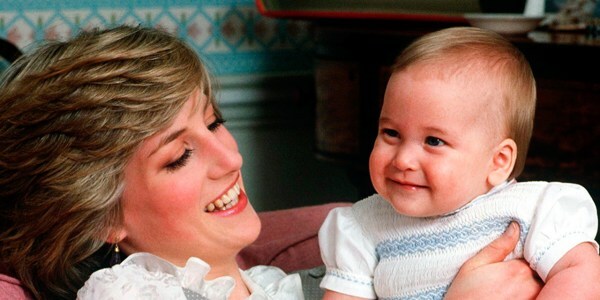 Diana, who had worked with Turner before, walked toward the camera, playing with baby William, and soon Charles joined in as the session spilled into 15 minutes. “From what was really going to be one portrait shot of the three of them [turned] into magnificent pages of pictures that went right across the world,’’ he said. As Prince George makes his portrait debut, take a look at these photos of royal babies throughout history.